What is a Fitbit? It is a watch, of sorts, that tracks different physical activities you do in a day to promote a healthier lifestyle. 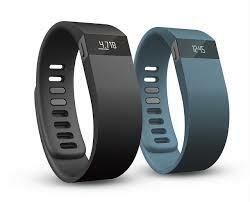 It can track your sleep habits, water intake and calorie intake. You can monitor daily goals with a Fitbit, such as how many steps you take, how many miles you walk, how many calories you eat, how many minutes you move without stopping, and how many flights of stairs you climb. You can also set reminders every hour to keep you on target. Some versions even incorporate heart rate monitoring. I can easily look at my Fitbit throughout the day to help me stay on track with my goals. My current step goal is 10,000 (the American Heart Association recommendation), which equals about 4.5 miles a day. My caloric intake is based on my weight goal, height and age. My sleep goal, based off my gender and age, is seven hours per night. My workout goal is to do something (walk, run, go to the gym) at least 5 of the 7 days in a week. There are three choices of heart rate goal to set for workouts: fat burn, cardio and peak. Fat burn is the low- to medium-intensity exercise zone and is a good place to start for those new to exercise. In this zone, a higher calorie percentage is burned from fat, but the rate at which it burns is lower. Cardio is the medium- to high-intensity exercise zone where you push yourself but don’t strain; and for most people, this is the target exercise zone. Peak is the high-intensity exercise zone. Short intense sessions can improve performance and speed. A Fitbit can also be set to monitor the three stages of sleep. Light sleep is the entry point into sleep, where breathing and heart rate typically decrease slightly. This stage of sleep helps promote mental and physical recovery. Deep sleep typically occurs within the first few hours of sleep. Breathing becomes slower and muscles relax as the heart rate becomes more regular. Deep sleep also promotes physical recovery and aspects of memory and learning, as well as the immune system. REM sleep is even deeper than deep sleep; this stage generally occurs during the second half of the night. In this stage the heart rate increases and breathing becomes irregular. REM sleep helps regulate mood, and affects learning and memory by helping the brain process and consolidate information from the previous day for long-term memory benefits. I personally love my Fitbit and its silent accountability. Don’t feel guilty about setting realistic goals for yourself in the beginning and gradually building to the goals you desire. YOU CAN DO IT!